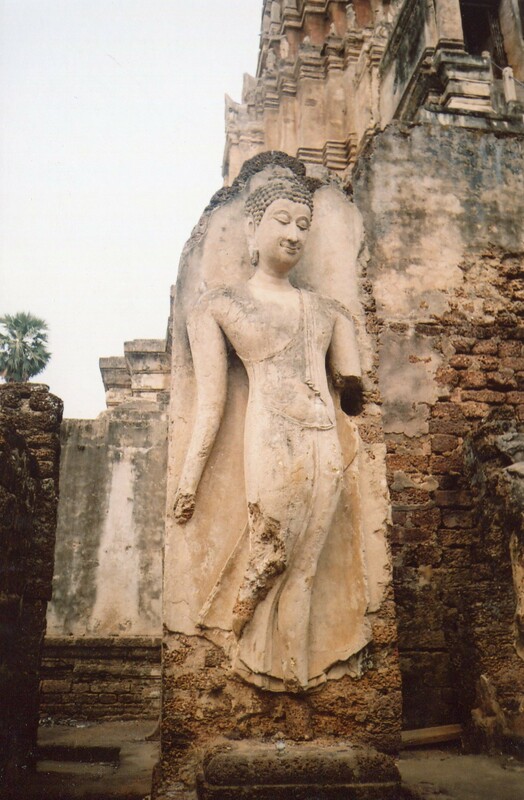 Sukhothai Buddha statues are some of the most revered art forms in Thailand. They have captivated many Western travelers too. 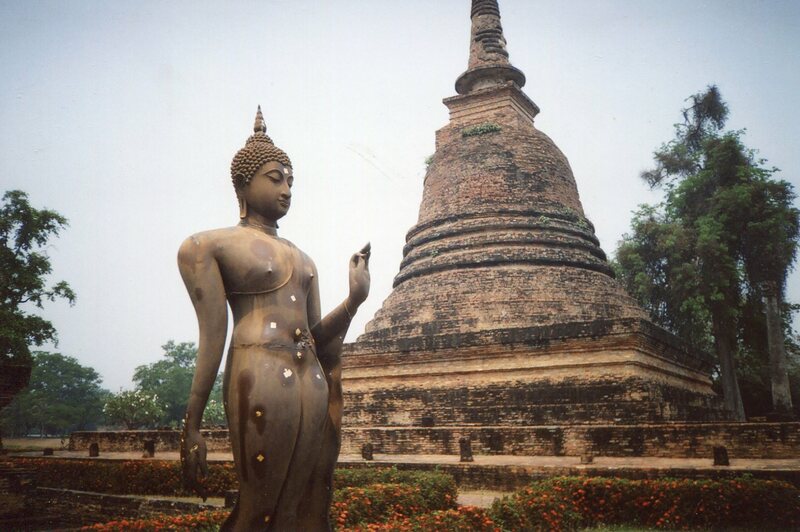 While Sukhothai style was being perfected, in the fifteenth century, Florentines were representing the body according to more Western conceptions. 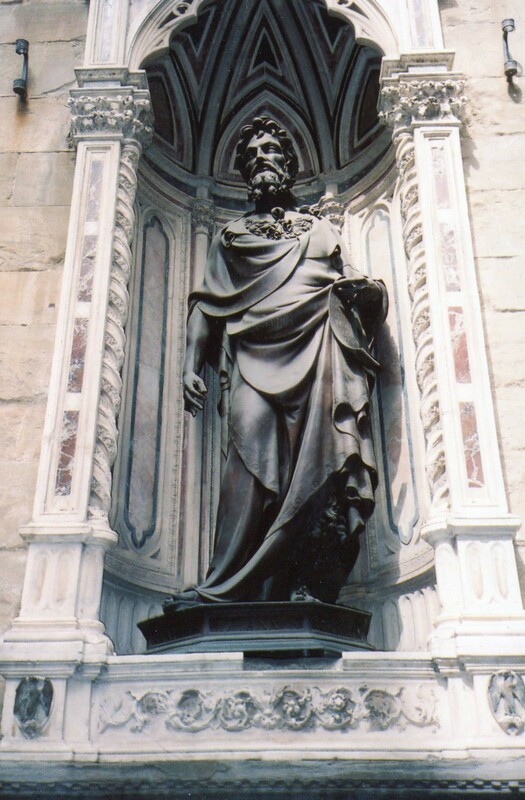 This statue of St. John the Baptist, by Lorenzo Ghiberti, is one of a set of statues on the outer walls of Florence’s Orsanmichele. They’re immensely influential in Western art. Several sculptors made them in the 1410’s, and they stressed the body as corporal and monumental, rather than the debased temporary seat of the soul that many medieval artists had seen it as. These statues inspired Masaccio and Masolino in the 1420’s, when they painted Adam and Eve as fully embodied people. They continued an artistic lineage that culminated in Michelangelo’s muscled figures. Renaissance Florentines were glorifying the body as a distinct entity that’s fully present in the world. But Thais were structuring their growing states around different ideas, and creating equally beautiful art as their models of reality. The Sukhothai Buddha is full of graceful curves. It imposes nothing on you–no confrontational Euclidean lines or sun kissed Italian beefcake. Gentle curves flow from the Buddha’s crown to his toes. A flame often flickers from the top of his head, and it flares in tall, thin swirls. His hair’s curls are smaller and more delicate than they are on most other types of Buddha statues. His face is long and oval, and the small mouth turns slightly upwards into a mellow smile (Thais value this soft happiness so much that they have a word for it, sabai). This gentle vitality extends down the body. Long sinuous arms hang from broad shoulders, and the torso tapers into a narrow waist. The whole statue gently ripples like a river. Thais made ideas of gentle flow a model of reality. They associated it with the rivers that carry their graceful narrow boats, and with benevolent metaphysical powers that the Buddha and a good king represent and conduct. The long curvy forms in these statues, and in many other Thai art forms help tame nature’s powers and keep society in harmony. We’ll explore more of these art forms in future posts, and we’ll see that Thai and Western culture converged from many dimensions. Every cultural landscape is infinitely rich.